This week’s selected book is The Poisonwood Bible by the American writer Barbara Kingsolver. I’ve read this book when it came out, in 1998, and was an immediate bestseller. It follows a missionary family, the Prices, who relocate from Georgia to the colonial Belgian Congo in the 1960s, around the time when the independence struggle has intensified. I’m sure every Western white writer who contemplates writing a book set in Africa first thinks of the Congo; their attachment to that book which Achebe did a famous take down of is really strong. Anywho. The Poisonwood Bible is a family saga and primarily the four daughters in their Belgian Congo adventure. For the most part, it’s well-written but somewhere in the middle the novel devolves into ideologies and preachiness. The next book is Broken Glass by Alain Mabanckou, the famous writer who was born in the Republic of Congo. He is prolific; he releases a book every two years. But to my disgrace, I’ve only read Broken Glass, a hilarious novel about a former teacher nicknamed Broken Glass and his favourite drinking hole, Credit Gone Wrong. A really good read and I’ve promised myself a Mabanckou reading project. The next book is Segu, a sprawling historical pre-colonial saga about the Bambara people and their encounter with Islam, Christianity and the slave trade. I love this masterpiece. Based on an actual place and historical events, Segu has plot twists, drama and intrigue. I recommend it everyday when someone asks for historical dramas set on the continent. Maryse Condé has an excellent bibliography. The next book is the epic meta-fiction Possession: A Romance by A. S. Byatt. Two contemporary academics explore the love between two fictional poets, Randolph Henry Ash and Christabel LaMotte. Byatt created fictional diary entries and entire literary works for these two poets. When I first read the book, I wasn’t aware that the two poets were fictional, so there I was looking up Ash and LaMotte! An involving, all-consuming read. The next book is Zukiswa Wanner’s London, Cape Town, Joburg which starts off with a suicide in the family of a mixed-race couple who’ve moved from London to South Africa after the end of apartheid. This book is about a marriage, family betrayal and the politics of new South Africa. An enthralling read with a heartbreaking plot twist. Read it! The final book is Taiye Selasi’s Ghana Must Go which depicts a family working through trauma and healing, in multiple cities – Accra, Lagos, London, Boston. A magnificent read, my favourite part is the first twenty pages it takes for the father to die. 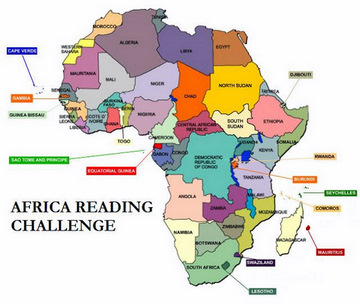 That’s six degrees of separation from The Poisonwood Bible to Ghana Must Go. We started in the Belgian Congo, then off to the Republic of Congo, then we stopped in Mali, off we went to Portugal, via Brazil, then England where we left for South Africa and then finally landed in Accra and Boston. We’ve travelled well in books. Hey, you’ve added three to my wishlist: Broken Glass, Segu, and London, Cape Town, Joburg. I really couldn’t get into Ghana must go, but I think that was more to do with how it kept triggering my own grief about people I’ve lost, than with the writing. I didn’t last those 20 pages. I’m going to look up some of the other books though, they sound interesting.